Kaslo BC Canada adventures. Kaslo BC is a small waterfront community located where the Kaslo River and Kootenay Lake meet. Surrounding the community are the peaks of the Purcell and Selkirk Mountains. During the Gold Rush days in the Kootenays (1890's) Kaslo was referred to as Kane's Landing. A major commerce and transportation port for gold & silver miners and prospectors. Kaslo BC is an activity and adventure destination with a small town vibe. Explore Kaslo BC Canada Adventures. Being that Kaslo is surrounded by forests and on the shores of Kootenay Lake is a sure sign there are some great Kaslo BC adventures to be had. Some of the activities enjoyed include kayaking, SUP, river rafting, golfing, boating, sailing, water skiing, fishing, swimming, birding, sightseeing, picnicking, hiking, canoeing, mountain biking, caving, cycling and, nearby there are opportunities to enjoy xc skiing, downhill skiing, snowboarding and snowshoeing. As you can clearly see there is no shortage of Kaslo BC Canada adventures. Some of the more popular Kaslo Canada adventure destinations to explore are Fletcher Falls Hiking Trail, Pilot Bay Provincial Park (Crawford Bay), Buchanan Lookout Hiking Trail, Kokanee Creek Provincial Park, Kokanee Glacier Provincial Park, K&S Wagon Hiking Trail, the Kaslo River Hiking Trail and, the feature adventure destination is Kootenay Lake. The SS Moyie sternwheeler located on the waterfront in Kaslo is the most popular attraction in the community. The passenger vessel is an early 1900 sternwheeler now operating as a museum. It is open to the public and is recognized as a National Heritage Site and BC Landmark. Need some relaxing and therapeutic pampering after an adventure. Hot springs are also a popular get-a-way for many families and explorers. 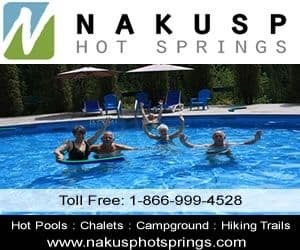 South of Kaslo are the Ainsworth Hot Springs and west are the Nakusp Hot Springs. Today... Kaslo's village streets are lined with Victorian era buildings and floral decorations. The buildings house some of the services important to travelers including accommodations (motel, inns, vacation homes, cottages, lodges, bed and breakfast, rental suites), tours, guides, campgrounds, pubs, restaurants, gas station, gift stores, liquor store, grocery store, coffee shop, cell service, internet, bank and transportation services including marina. eh! Plan to Visit Kaslo, BC, Canada today.